With fewer than a handful of creative writing programs in the country, it was unheard of for a small, liberal arts college, let alone a women’s college, to support a graduate writing seminar. Rubin, however, believed he could create a program at Hollins that stressed writing as a discipline and profession. From its inception, the Hollins creative writing program has focused on community and forming strong relationships between and among faculty, graduate students, and undergraduate students. 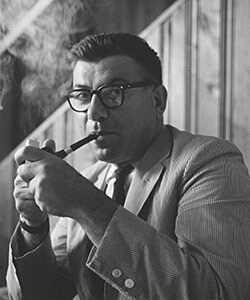 Even with all of its early success, it is unlikely that Hollins’ program would have become the nationally recognized program that it is today if Rubin hadn’t aggressively recruited working writers to come here for one-year stints as writers-in-residence. In 1963 William Golding arrived in Virginia from England. His novel Lord of the Flies had been in print for seven years, but it hadn’t become a bestseller until 1963. Golding’s celebrity status propelled Hollins into the national eye. In the following years some of the most celebrated writers of the second half of the 20th century—Flannery O’Connor, Karl Shapiro, Eudora Welty, Robert Penn Warren, Andrew Lytle, George Garrett, Howard Nemerov, Richard Adams, Shelby Foote, among many others—streamed through campus.